NHRA team owners John Force and Don Schumacher aren't exactly seeing eye-to-eye right now. In F1, it’s (right now anyway) Mercedes vs. the world. Currently, NASCAR has its Hendrick vs. Gibbs vs. everybody else. IndyCar’s Penske/Ganassi wars are legendary. Then there’s NHRA’s John Force and Don Schumacher. Big Time Owners. Big Time Winners. Big Time Egos. Comes with the territory. Tensions between these two boiled over like a cracked crankcase at the first race of the season when Don Schumacher and John Force met up with one another near the start line during Saturday qualifying. Force went to shake Schumacher’s hand and The Don instead clasped the 147-time Funny Car winner’s shoulder. They exchanged words. It was not friendly. Don Schumacher Racing has been the most successful NHRA Mello Yello Series team over the past decade, taking both Top Fuel and Funny Car championships in the most recent campaign. DSR doubled up in the season opener - again - with top qualifiers Leah Pritchett (Top Fuel) and Funny Car’s Matt Hagan earning Wally trophies for their wins in the 58th Circle K NHRA Winternationals on the Auto Club Raceway at Pomona dragstrip. 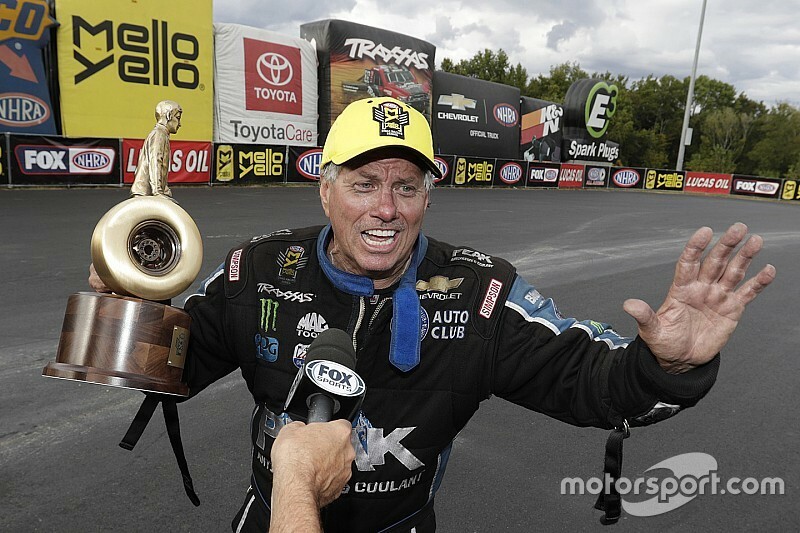 By contrast, John Force Racing’s most recent title came with the patriarch’s 2013 Funny Car championship. Daughter Courtney Force was runner-up to Hagan last weekend. The battle, it appears, is not just between the two mega teams. It’s a bidding war for tuners, crew chiefs and top personnel to run those teams. Currently DSR has seven squads: Three Top Fuel teams for three-time and reigning champ Antron Brown, eight-time champ Tony Schumacher and Pritchett; four Funny Car squads include reigning champ Ron Capps, two-time champion Matt Hagan, 2012 titleholder Jack Beckman and last year’s runner-up Tommy Johnson Jr.
JFR has four teams: three Funny Car teams for 16-time titleholder John Force, 2009 champ Robert Hight and Courtney Force; a single dragster team for daughter Brittany Force, who won her first three races during the 2016 campaign. While Schumacher’s large complex is home to 16 NHRA world championships, his territorial neighbor up the street has 18 world titles. At this time DSR leads in national event titles with 295 while JFR has an even 250 event wins. 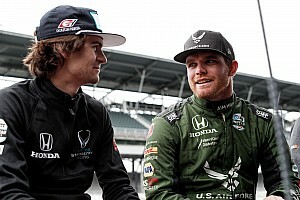 Video interviews with both Force and Schumacher have been making the online rounds, with John saying, essentially, he wants to be friends eventually and go fishing with Schumacher and The Don responding that Force is killing the sport by overpaying his crew chiefs. Some background: In 2014, John Force wasn’t sure he’d be racing the following year after losing Ford and Castrol, his partners for more than 15 years. In late summer, he told his crew he didn’t know his plans and to look afield just in case. So crew chief Jimmy Prock did just that, as did engineering magician John Medlen. They had an offer with Schumacher and Prock told John Force, who said leave now. Both of them left and went to work with Jack Beckman’s Funny Car team. Prock, who is known for his shoot-the-moon aggressive tune-ups worked well with Beckman over the past two years. 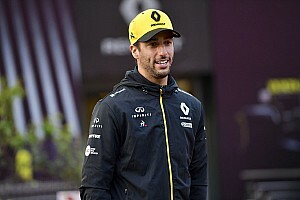 They finished fifth in the 2016 standings with seven No. 1 qualifying positions, four elapsed-time and seven speed records and recorded the second-quickest 3.825 second ET and second fastest (334.15 mph) speed for the Funny Car category. But still, at the close of the season, Prock, who had worked with Force for 14 years before leaving for Schumacher’s, made the decision to return to Force’s camp. The call to return has plenty to do with John Force and Jimmy Prock working well together, but even more to do with Prock’s younger son Austin, an aspiring racer who was moving up nicely through the open-wheel midget ranks. After Bryan Clauson’s tragic death last summer, the family had a second look at Austin’s progress and decided it might be a better, even safer idea to put him in a dragster. John Force has wanted a teammate for second daughter Brittany’s Top Fuel team and Austin Prock is going to learn the same way that Ashley, Brittany and Courtney have done: moving through the straight-line ranks from Super Comp to Top Alcohol Dragster and then on to the quickest and fastest category in the NHRA universe: Top Fuel. Still, the changes didn’t sit well with Don Schumacher, who felt he’d been poached, even though Medlen elected to stay at DSR and brought 22-year JFR stalwart Dean “Guido” Antonelli along with him. That duo, together with Neal Strausbaugh are tuning Beckman this year. This is nothing new for Fast Jack, who had to break in a new crew in the spring of 2012 - and still won the title that year. Beckman has had crew changes throughout his career but it never has changed his competitive nature. The titans’ family feud put a bit of a froth on an excellent weekend of racing that saw all three No. 1 qualifiers holding trophies by the end of the day. It was a homecoming victory for local product Pritchett, who’d always dreamed of winning at her hometown track. Hagan, who battled Capps for the title up to the penultimate day of the 2016 season, had a rough off-season, losing both his grandmother and younger brother. The tension Hagan felt showed everywhere but the racetrack, although the Virginia cattle farmer nearly lost in the semifinals when he appeared to cross the center line of the track, always an immediate disqualification. His competition in that round, Ron Capps, had fouled out and left before the light turned green, but that’s considered less an egregious error than a center-line stumble. It took measurements by NHRA to determine Hagan’s tires hadn’t crossed the line. Discussion on that call continues through midweek, after Hagan won his 23rd Funny Car event title. Pritchett’s victory against a tire-smoking Doug Kalitta, who qualified second behind her after three sessions (Friday evening was rained out) was her second overall and first with DSR, where she’s tuned by Todd Okuhara and Joe Barlam. Excited to win in front of friends and family that commuted from nearby Redlands, Pritchett and her team are “definitely taking delivery from the momentum last year.” Next stop is Phoenix, site of her first victory with since-shuttered Bob Vandergriff Racing. In Pro Stock, it was the usual characters atop the standings for both qualifying and the race, as Jason Line’s Chevrolet Camaro beat teammate Greg Andrson in the final round. It wasn’t an easy route for either one of them, as Line battled rookie Tanner Gray in the second round and squadmate Bo Butner in the semifinals. Anderson had to face off against a resurgent Erica Enders - back with Chevrolet - in the semifinal round in order to meet Line, who had the better reaction time en route to his win. After an exciting first weekend of racing, it’s time for teams and their owners to prep for next weekend’s race No. 2 at Wild Horse Pass Motorsports Park outside Phoenix, Ariz. Pritchett leads the Top Fuel standings, followed by Kalitta, Brown, Schumacher and Brittany Force. 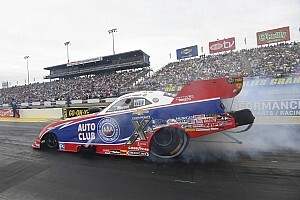 In Funny Car, it’s Hagan, Courtney Force, John Force, Capps and Beckman in positions 1-5. Pro Stock belongs to Line, Anderson, Butner, Enders and Vincent Nobile, all driving Chevrolet products. Will the biggest team owners calm down and agree to privately disagree after all? 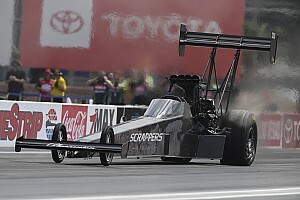 Or will NHRA become a loud Hatfields vs McCoys shouting match through the next 23 races?